So we have decided to change things a little, instead of reviewing four products every week we are thinking about mixing it up from week to week. Sometimes doing one, other times doing a mini haul. For example this is a product that I picked up in New York that I am craazzzyyy about so I felt it deserved its own post. Other weeks there will be products that can share the limelight. Anyway let us know what you think about changing it around! 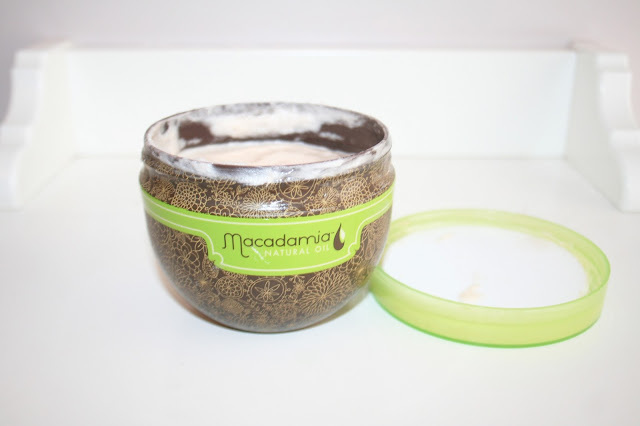 So this Macadamia deep hair masque is something I've wanted to try out for ages. People have been raving about it online and I wanted in on the action, so you can imagine how happy I was to find it at a bargin price in Nordstrom Rack on a recent trip to New York. I've used it twice since I brought it and I LOVE it. It's so so so good, I've tried a lot of hair masques from different brands and i've never been blown away at all--they're always good, but not great. I often feel like using words like 'deep repair' are a bit cheeky, what they should actually say is 'semi-helpful'. Not this beauty! It does exactly what it says on the pack, it really gave my hair a deep condition. My barnet is quite damaged by the ol' heat and recent colouring so it was in real need of some love and this conditioner does exactly that. The second time I used it, I left it on for about 15 minutes and sat in the sauna with it.... Now this my friends did more than repair my hair, I honestly felt like I'd had a hair transplant!! It instantly felt smoother and looked cared for and shiny. After using twice it has heavily reduced frizz, static, dry ends and general dullness. I couldn't rave about this anymore, I have quite dry to frizzy hair, so would definitely recommend it to any of you that have a similar hair type. But would love to know what others think of it as well?